8.2 Steel vs. Aluminum Road Bike Frame? 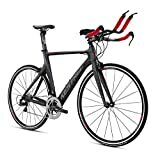 8.3 Are Aluminum Road Bikes Good? 8.4 Is Titanium The Best Road Bike? 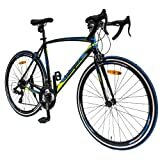 8.6 How do I know what size of road bike to buy? For any cyclist, aspiring or expert, the challenge of searching through all of the the best road bikes for your own needs can be tough. So much has to be considered that it can become a bit of a pain of to come up with the solutions to these issues. Therefore, if you are looking to make sure that your next road bike purchase for 2018, is going to be as good value, as is possible, here’s the place to start. We’ll take a look at the major factors that can help determine the success – or failure – for choosing the best road bike. The first part of the road bike that you want to think about is going to be the road bike’s frame. The framing of a road bike is very important. Typically, you will get the best road bikes made in either steel or aluminum; however titanium is becoming more popular. 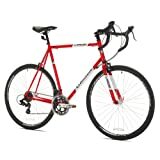 Steel vs. Aluminum Road Bike Frame? While aluminum has become the most popular option for road bikes under $1,000, some people still prefer to pay and get a steel bike. Aluminum road bike frames are mostly found on tour bikes, as then you aren’t being punished as much for the weight side of things. Much heavier than aluminum, steel tends to be a much more durable frame for road bikes that need to endure dings, scratches, and not bend. Aluminum road bike frames are generally stiffer, creating a harsher ride and perfect for shaving time off of performance, however a ride down to the market, steel framed road bikes may give you a better ride. 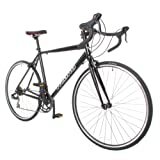 Are Aluminum Road Bikes Good? Many people, naturally think aluminum frames are lighter than steel road bike frame, and make the best road bikes. However, to make aluminum frame sturdy, the amount of aluminum needed for the same sized tube, may just outweigh a steel frame. Shop for both, and read reviews. Is Titanium The Best Road Bike? Of course, you could also pay more than $1,000 for a titanium road bike for sale, or buy a frame, and build your own. While rare, the titanium road bikes tend to be some of the best road bikes bikes, from a design standpoint. 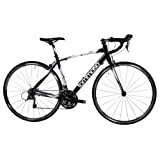 Road bikes typically come in only two styles, which plays a big part of your decision, on what size road bike to purchase. Determine if you are purchasing a racing road bike (longer top tube and lower in the front, for speed) vs. a sport road bikes (shorter top tube and higher front, for more comfort), now get measuring. 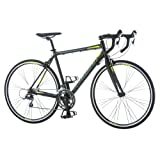 How do I know what size of road bike to buy? Always check the manufacturers recommended sizing, as road bikes come in very different styles and may have sloping tubes, and depending on your preferred position, for long rides, or fast rides, these recommendations may vary. Use these as a good rule of thumb for knowing what size of road bike to buy. Typically, the main thing you should be looking at is the size charts on any bike that you are looking at. The basic rule is that you can stand atop the frame, with around 2cm of space between you and the top tubing of the bike. Without that, you are too close and thus you need to find a smaller bike. Typically, your road bike assembly, will be made by one of Shimano, SRAM and Campagnolo models. The build of the bike is something that many underrate, so take the time to look into the pros and cons of each of the functions that your potential bike carries. The build matters: from the use of electronic shifting to how the brake levers are managed, you can soon find that you have a major preference over one or the other – it’s worth taking the time to investigate, though. So, with this in mind, you should find it much easier to locate that high-end bike that is going to suit your needs and functions perfectly.